@celebface shows us that it doesn’t matter how famous or wealthy you are, insecurities can get to anyone. After stumbling across the Instagram account @celebface not too long ago, I became hooked right away. It took every ounce of willpower in me to stop scrolling through the thousands of posts that revealed shocking alterations celebrities had made to their Instagram pictures. A waist synch here, a face lift there, and this was coming from people who we, as a society, have deemed to be perfect. We’ve all been there. Staring at a picture of Bella Hadid, cursing our luck because we didn’t end up looking like slim, long-legged, picture-perfect goddess. Well guess what? Neither did she. You think the Hadid sisters wake up with perfect skin and flawless hair every morning and go about their faultless lives being happy and content all the time? No. Even Victoria’s Secret models wish they could change certain features of theirs, ones we would never think they would be dwelling over. @celebface reveals this to its 800 thousand followers and in return receives a high degree of activity including extensive comments and tags expressing surprise and even disappointment. 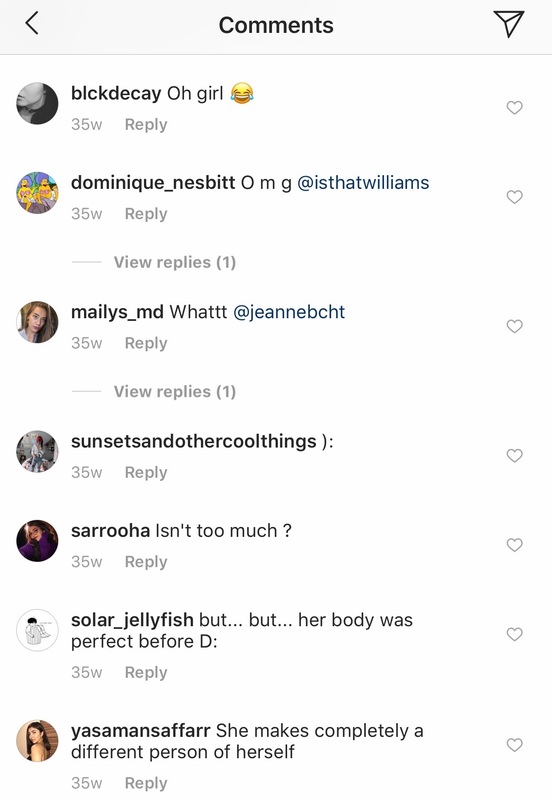 Some users become frustrated at popular figures who preach body-positivity and self-love but photoshop themselves to fit society’s ideal body image. Screenshot taken from the comments on an @celebface post. Members of the Kardashian family have even received heavy backlash for photoshopping their young children. Instances such as these illustrate the extent of unauthenticity that exists online, thus showing how unhealthy it can be to be impacted by such outlets. I guess the advantage of a page like this is to remind young, impressionable people that it is not always as it seems, to show them that they shouldn’t sought after something that doesn’t even actually exist. What do you think about accounts like @celebface? Let us know your thoughts on the matter in the comments below.